One of the most underrated of all its relatives is the Table of Contents menu found at the beginning of modern publications - print or electronic. Select three of your textbooks and compare their Tables of Contents. - lists of index(es) and other extra-textual material. What interesting fact(s) did you discover that you didn’t know before about any of your textbooks' organization? What improvements can you make to one of the Tables of Contents you examined? 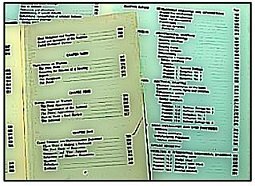 Return from Table of Contents menu to Menus hub page for even more menu teaching ideas! Return from Table of Contents menu to Real World Content Advantage home page.